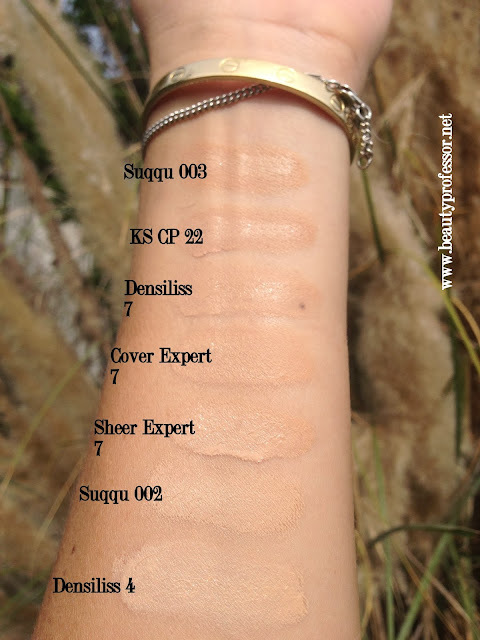 Beauty Professor: Foundation Swatch Comparisons...Suqqu, By Terry, Kanebo Sensai! I shall do my best! Lately, I've been bouncing between the Densiliss #7 (on shorter work days) and the Suqqu #003 (with a smidge of #002 mixed in) for my super long lecture days (the lasting power is better!). I can't say that it is better than the Kanebo (which will always hold a special place in my heart). It is just different. In my experience, the Kanebo is slightly glowier while the Suqqu is quite matte (but still skin-like in nature). 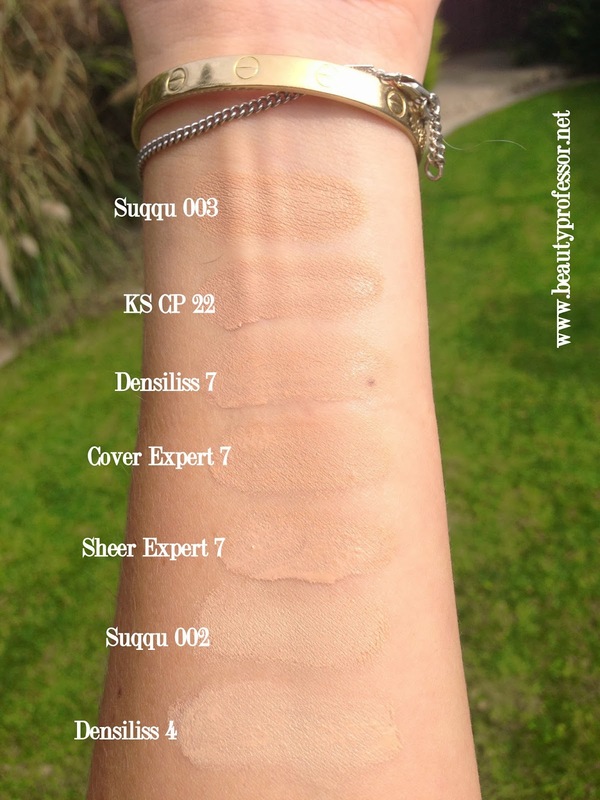 Also, the Kanebo is more of a neutral beige while the Suqqu in 002/003 is more yellow (but NOT orange) in undertone. Thanks for the comparison swatches. So helpful! Thank you ever so much ; ) I, too, am finding that #003 is working well on it's own, though I often add a smidge of #002 for good measure since I add bronzer/contour on top. My arms and chest are darker as well! I will be working on a compare and contrast soon! Also, I should be receiving samples of the new KGD Aqua formula soon (so swatches should be up in the near future) and cannot wait to compare this new variation to the original...we shall see. xoxo, talk soon and have a marvelous weekend! The only idea I have for my coloring is that I have light skin with some ruddiness. 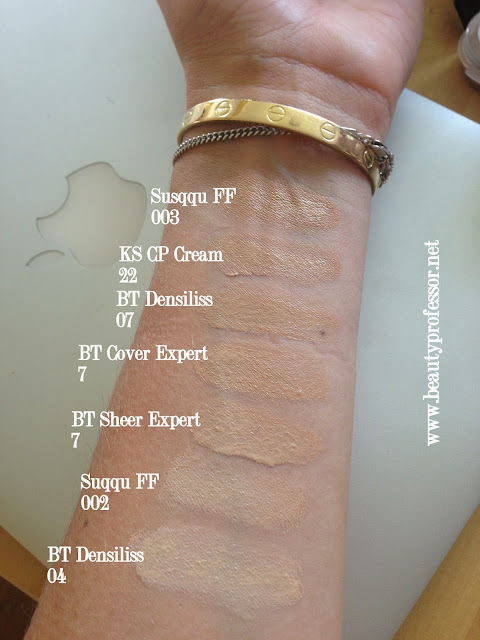 I am Fairly Light in Bare Escentuals, but not sure if you are familiar with their colors. I prefer neutral colors because I do not like to accentuate the redness in my skin with pink toned foundations. Sorry for going on and on and on :) Any help you can provide would be greatly appreciated!!!!!!! Thanks for your kind words...I have fun keeping this blog going and appreciate the positive feedback! With regards to your question, I think you would love the Kanebo Sensai Cellular Performance Cream Foundation. It is great for combination skin, provides glowing medium coverage, doesn't irritate sensitive skin, is hydrating and has anti-aging skincare benefits...it is truly the best "all around foundation" and I use it multiple times a week, even though I have other amazing formulas as well. I think you could get away with Bamby Beige, Warm Beige or perhaps Natural Beige (if your coloring is like mine). This formula can be picked up at Neiman Marcus! Hi, I wear Bobbi Brown foundation in #3 Beige. Do you think 002 or 003 is a match for me? Thanks! I think that 003 is probably a better match as 002 is very light. The combination of 002 and 003 would likely give you the perfect shade equivalent to #3 Beige, but that would be an expensive investment! Do you think that you will be able to wear the Suqqu 003 in the summer? How does it compare to some of your darker foundation shades like Terry Cover expert 9 or LMDB 9? I find that Suqqu #003 is just a touch lighter than both By Terry CE #9 and LMdB #9 (which are both about NC 30). 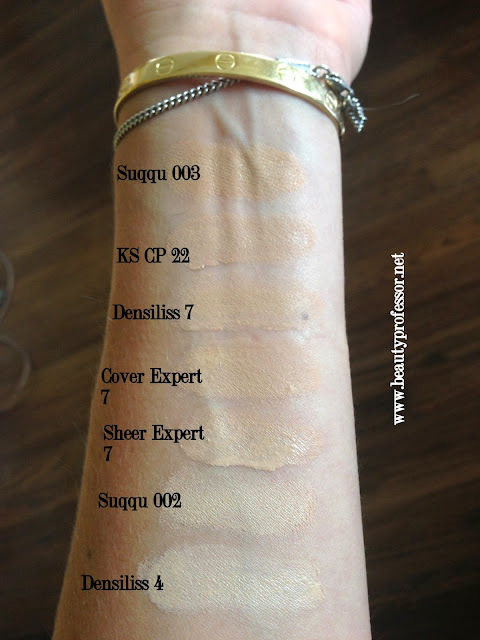 Hello, I am trying to pick my shade for BY Terry sheer cover expert. 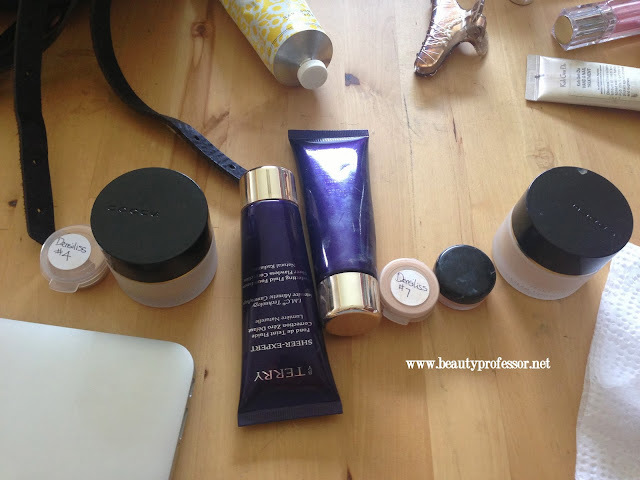 I wear 1N1 in Estee Lauder perfectionist foundation and i also own a Chantacaille futere skin foundation in alabaster. What shade would you reccomend getting? Hello...I would recommend #4 or #7 in the By Terry Cover Expert!